NOTE from Stuart: This is a reblog of Dan Yurman's blog post: Stuart Smith on Twitter. On Jan 26 Stuart O. Smith, Jr., gave an informative and entertaining presentation to about 50 people at the CDPUG monthly meeting. Since his first “Hello World” on October 1, 2009, Smith has been using Twitter to promote tech, social media, blogging and some entrepreneurial events in the greater Cleveland area. Cleveland Business Connects Magazine’s September 2012 issue has the overall theme of information technology and social media in Cleveland. An article, "Networking 2.0: Techies Harness the Power of Continual Education," was written about WebSigCleveland.org and its partner organizations, the Greater Cleveland PC Users Group and the Cleveland Digital Publishing Users Group. These groups are headed by Jim Evans and Remington Phillips, respectively. The article focuses on how these three Cleveland organizations provide face-to-face technology education. I love the title of the article, since I am a big supporter of continual education. This has led me to not only become the administrator of WebSigCleveland.org, but also to create my sosAssociates.com blog, which supports technology education groups in our community. When attending the April 26, 2012, Cleveland Digital Publishing Users Group meeting led by Spike Radway on Presentation Skills for the Graphic Designer, who would have thought I would be truly surprised . . . but I am getting ahead of myself . . . The purpose of this meeting was to have Spike provide the tools to those attending to be prepared to do an Ignite presentation. 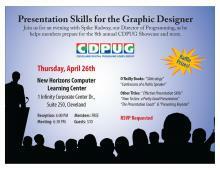 CDPUG has a great practice of starting their meetings with a member sharing their design work using the Ignite presentation method at their monthly meetings, but for this meeting, the focus was the upcoming 8th Annual CDPUG Showcase on May 31, 2012.